Craft whirligigs are easily constructed out of plastic canvas and some yarn. 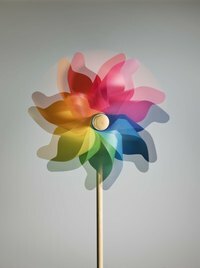 Whirligigs are also known as wind spinners. They have a spiral pattern to them that spins easily in the wind and makes them eye catching. A homemade whirligig is an inexpensive craft you can make and hang yourself. You can decide the colors for your own spinner. Plastic canvas comes in a variety of colors. Use matching yarn to accent your whirligig to your home decor. Cut two matching pieces of two different colors of plastic canvas with the scissors. The pieces need to be 40 holes long and 27 holes wide. Cut out every other row to be 13 holes long on each side. Cut out the opposite row on the other side of your strip. There will be gaps in between your strips on each side. Your two separate pieces should look identical. Cut out two strips of the same color to be two holes wide and 77 holes long. Place your two matching pieces with the strips you cut out back to back evenly. Take one of the 77-hole strips and hold it along the edge of one side of your strips. Use a plastic canvas needle and thread the yarn through the hole. Sew the edges of your strips to the long piece to hold them together. As you keep sewing, that side of the whirligig will start twisting into shape. Tie a knot at the end and trim off the excess yarn. Sew the 77-hole strip along the opposite side of your whirligig the same way. Allow it to finish twisting into a spiral shape as you go. Tie off the yarn at the end. The whirligig will be spiral shaped and ready to hang. Tie a piece of fishing line to a snap swivel. Connect the line to the top of your whirligig to hang it.